Seems like oddnanref hasn't logged in for a while. If there's no responde till the weekend, then I'll step in and judge instead given noone minds. When ~ enters the battlefield, you may exile target enchantment you control, then return that card to the battlefield under its owner’s control. Whenever an enchantment you control enters the battlefield, you may put a +1/+1 counter on target creature. The Illpoti take the art of a shared dream very literally. OK then, seems like I'll take care of this. Please no further changes of entries! Whenever you search your library for any other card, you may reveal an enchantment card from it and pay . If you do, you may put that card on your hand. This is a weird yet interesting design – I don't think it belongs below rare, though. Repetative tutors (even if this one requires some additional help) really don't work at uncommon. 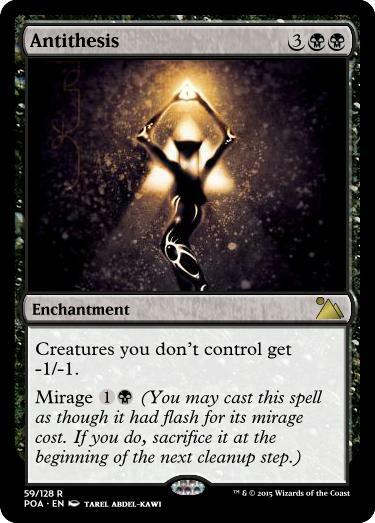 When an opponent plays an enchantment, you gain X life, unless they pay an additional X, where X is the converted mana cost of the enchantment spell. 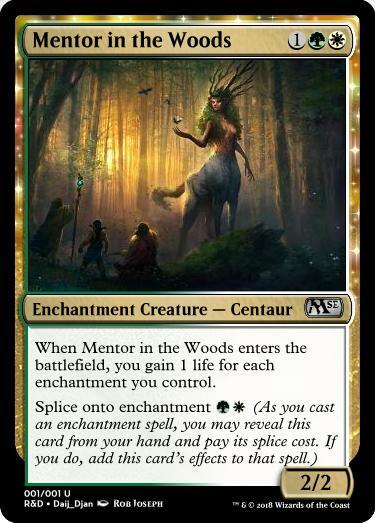 OK, first of all a wording nitpick: „Whenever an opponent casts an enchantment spell, ...“ That aside, I don't think this belongs at common. It requires your opponent to play a specific card type (which isn't used in many decks, especially in Limited) but when it hits, it hits quite hard. I guess it works fine at uncommon, though. I don't think it would be interesting to use this card in 1v1 matches – multiplayer however..
As long as Hexholder Golem is enchanted, it gets +2/+2. When Hexholder Golem dies, return target enchantment card in your graveyard to your hand. Nice clean and simple. Might not be the most „creative“ design (to quote oddnanref's original challenge), but I like it. When ~ enters the battlefield, you may exile target enchantment until ~ leaves the battlefield. "Step forward and be cleansed." This is a pretty cool one. Since this effect has started showing up in white, it mostly appears targeting creatures or nonland permanents with Isolation Zone being the only existing card to call out enchantments in particular. And while that card also targets creatures to basically never be a dead card, this really isn't an issue with your design as the effect is put onto a rather powerful evasive beater. Love it! Whenever an enchantment enters the battlefield under your control, Charcoal Disciple deals 2 damage to target player. Reminds me of Enchanter's Bane – in a good way. 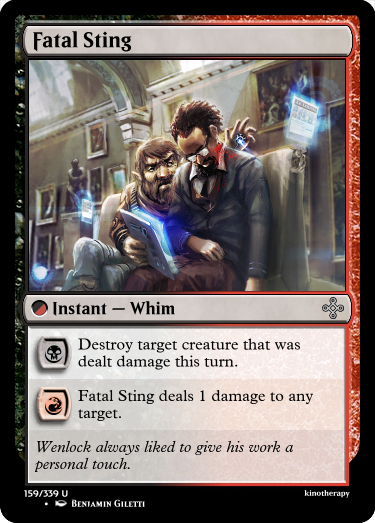 Interacting with enchantments is always tricky for red in particular, and while this card cannot stop your opponents from playing enchantments, it sure can punish them for doing so. Cost, stats and rarity all seem to be fine as well – nice work. When Sculptor of Ideals enters the battlefield, create a token that's a copy of target enchantment. Sacrifice that token at the beginning of the next end step. "No force on earth rivals the pure potential of the dreaming heart." Creating copies for a turn normally is a red thing, but I guess it makes sence in white/blue when it's about enchantments. That aside, I like this concept very much – maybe because I like turning enchantments into instants with „until end of turn“ effects? Considering how powerful this effect can be though, maybe limit to enchantments you control to slightly lower the power level (as it feels quite pushed at uncommon – might just be me, though..)? Allure – When Starcloak Mother becomes enchanted or equipped, it gains indestructible until end of turn. Interesting concept that makes me think. As your card doesn't gain indestructible permanently while being enchanted/equipped, the effect really only matters much when you can trigger it at instant speed – which is something neither Auras nor Equipments normally do. So I wonder what kind of support a set would be able to give to really make this one shine.. Then again, if you do manage to pull it off, it'd be amazing, I assume. That's.. interesting. The blink effect nicely works with ETB abilities or allows you to move a Pacifism to a new target while obviously then triggering the second ability. Costs and stats look just right as well – all in all, this is a really cool arcun. Love it! We really had some very interesting designs around this time. To be honest I had a hard time deciding on the winner, but in the end I give the win to monger with ZephyrPhantom being a very close runner-up! It's very much a Commander-style card, yes. But I agree on the rarity, I think it makes more sense as an uncommon but I figured since I'd already posted it, it didn't make sense to change it. Thanks for the positive response! put a growth counter on Growth Fields. The Verdant Forests of Aruilla. Suo looked around at the forest before her and marveled at the sight. Once, not-so-very long ago, at least for her, this area had been a dying, reborn, struggling thing. The civilization of Anh had predated even Suo, though not her long-lived race. Once, it had been a great and powerful empire that stretched across the lands of Zilnas in a swath of White and Blue, the colors of their Standard. Taking another moment to gaze in awe, Suo eventually began to meander through what the forest had become. Color was splashed everywhere the eye could see. This forest wasn't just an earthy mix of browns and greens, it was as vibrant as a painting, more vibrant than most still-lifes, to be sure. 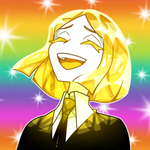 The Asii woman was breathless as she turned around, moving in a complete 360° while looking up. Sunlight managed to splash through the tall mix of trees from Bone Coast Firs to Acki Valley Sequoias. It was a small, but subtle reminder of what it had taken to give new life to this place. Trees that could coexist with one another, but couldn't be found together in any other place in the world. Aruilla was the home of her people, but it wasn't a kingdom in the truest sense. The Asii where nomads, though even that description didn't truly fit either. They had cities, and many Asii lived in one place for most or all of their incredibly long lives. What made them different from a traditional kingdom was their affinity with the natural. Now known as the Verdant Forests of Aruilla, their abysmal state the last time Suo had looked on them was due, in large part, to one of the defining characteristics of civilization: uniformity. At first thought, that didn't sound right at all. Suo had traveled far and wide across Zilnas and the variety of cultural difference between nations went from slight to truly outlandish. If one visited the neat, ordered white stone of Gilna, and then went halfway across the world to the sandy streets and adobo hovels of Vyria, they could very well believe they weren't just in a different place, but an entirely different planet. However, as much as they might be different, just as much of them was the same. Whether the streets were cobbled with stone or packed sand, there were still streets. And, as different as their living structures may have appeared in contrast to one another, within their own environments they were, by-and-large, just like the other structures in their domain. Aruilla had less of this than any nation she had ever seen. Rather than adapt the land to fit their culture, their culture was adapting to the land to fit with it. This resulted in drastically different looks and environments even when their makeshift settlements were mere miles apart. Further, while the denizens of Aruilla adapted to their environment, they still retained enough of their idiosyncrasies that their homes even within the same settlement often reflected generations of history elsewhere, and created eclectic varieties of style and architecture, even if they all used the same or similar materials. But this forest had previously been settled by a more conventional civilization, and it had been tamed to their tastes. It had been killed for the sake of the people who called it home. When the kingdom fell, it sat for many years in a state of abandonment, and nature had tried her best to take it back. But she was struggling, so deep and broad was the damage that she could only reclaim it with help. That was when Aruilla had come upon it. Not being a traditional kingdom, they didn't conquer land, for they did not truly believe in ownership of it. They respected the sovereignty of other nations, but made little claim to where they lived other than by having their presence there and defending their homes from would-be conquerers. When the Aruilla had arrived, her people brought seeds and already living trees from all over Zilnas. It had been a tedious and extensive project, and not without controversy. Many Aruillians believed in the sanctity of letting nature thrive on its own. After all, it was a central tenet of their people. However, the more progressive elements of Aruillian society had fought with a different interpretation of the same principle. They weren't just residents of the world, they were stewards of it as well. Yes, they let nature have its freedom to grow, but they had long had traditions of protecting the environments they lived in, and promoting that same protection to other nations. Suo found a stump to sit on, a relic from the forest's past. Still, though it was a reminder of what was lost, it was still a part of the natural environment as well, and she sat there, marveling at the resilience of nature. A template I've been playing with. Whims are mechanically similar to split card; you choose which mode you're casting (only one) before you choose targets and then determine the cost accordingly. All whims have a fixed CMC, with the different mana costs only varying by colour. Target creature gets +4/+4 and gains trample until end of turn. Create a 1/1 white Bird creature token with flying. Punch deals 2 damage to any target. Levelers count as non-standard frame? When CARDNAME enters the battlefield, destroy target artifact. Irregular in form, but consistently destructive. Utility effect that most draft decks want combined with a backside that mostly ramp will want. This contest will close in around 20 hours- get entries/edits in! Lastminute entry, using the "clear with colors" template alongside an old pet mechanic of mine. Time to do something weird..
One of the biggest problems with splicing onto permanents is memory issues, but I think an ETB trigger solves this (considering it even disappears if you were to blink an enchantment you spliced this spell onto). Also for the record: The card referring to itself isn't an issue. Contest is closed, judging will begin shortly. It took a minute but judgment day is here. I like the overall idea of the card, especially the Shine side. At the same time, I’m leery of the instant-speed, unconditional reanimation on Rise (esp. 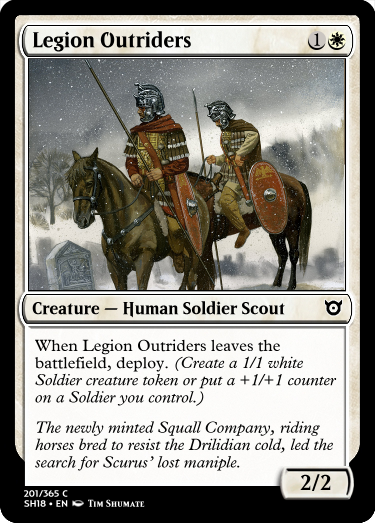 in white, as recent reanimation has mostly had power/cmc restrictions). 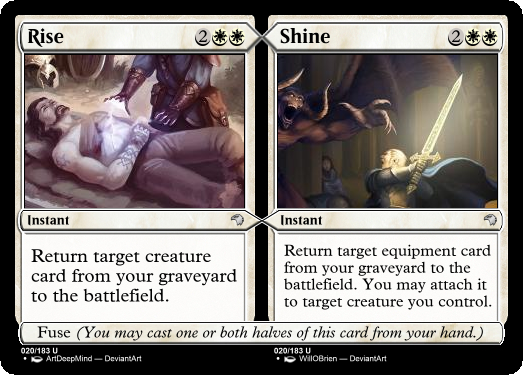 Shine could potentially be 3cmc but that would depend on equipment quality. : Add " style="max-width:100%;"] " style="max-width:100%;"]. First off, big props for the story, even if the card’s flavor only reflected a portion of that. The card itself, however, needs some changes. Producing two mana is powerful, even if the card enters the battlefield tapped, as the mana is colored and thus usable more often. Even being legendary isn’t exactly a drawback, as other copies of Growth Fields can still function as the front side, even building growth counters and replacing your current copy. A better course of action may have been to have the transformation involve hitting a growth counter threshold and potentially change the conditions of the back, but the card’s uncommon-ness is already a bit questionable. Whims are a neat idea, but at the same time I’m unconvinced that they would be different enough from split cards- I suppose it allows for a larger piece of art, but the text size would be essentially the same alongside the cost restrictions you mentioned. Fatal Sting itself is really slick, while the black mode is better most of the time the red mode adds additional options. Flavor is nice as well with a perfect piece of art. Love the name and art. I feel it takes a little long (6 mana?) to get to the attack trigger, which is ok but not worth the cost. 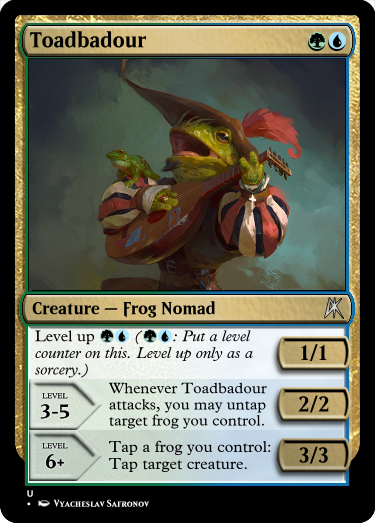 I like the last ability, but again I doubt the Toadbadour provides enough value without a level and even at 3-5 (considering the cost). Could work better w a lower level cost and/or lower level threshold. Also- it loses the attack trigger when it gains the activated ability, which is a bit unintuitive.
" 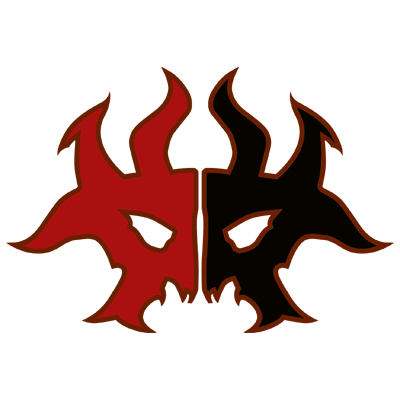 style="max-width:100%;"] : Transform CARDNAME. I feel this should be uncommon, mostly because maindeck-able artifact destruction in two colors will hamper the (already small) number of playable artifacts in whichever limited enviro this slots into. I like the overall idea of being, as you said, utility plus payoff. Back side’s statline is probably fine compared to EMN werewolves, but hybrid has me thinking it could drop by 1 point of power, esp. at common. I’m a little worried about the cost, as casting this for CMC 4 is already a pretty nice rate and CMC 3 is very good. How good/mediocre it is depends on the amount of “colorless fixing,” I suppose. It could even see constructed play with the same caveat. 702.46e The spell loses any splice changes once it leaves the stack for any reason. Unless I’m thinking about timings wrong, the enchantment would leave the stack (and lose the trigger), so as it enters the battlefield there would be no ability to occur. It’s also a little unintuitive in general- it makes sense when you think about the text box, but I can see new players wondering about p/t or if it becomes a creature. For the next challenge: Design a Constructed-targeted common card. It's still a common, so it shouldn't mess with Limited (i.e. it shouldn't be too complex, and it shouldn't be useless aswell as not being too powerful) but it should work in some tournament level deck in some format. Captain - As long as you control your Commander and a Lietenant, Wretched Shambler gets +2/+2 and has vigilance. Zombies may not usually make great leaders, but they're fantastic at following orders." For whatever reason, I can't get Lieutenant to un-italicize. Not to be a nosy Nancy again, but this doesn't work either, for the same reason Divine didn't; Lieutenant is a pseudo, which has no rules meaning and, ergo, can't be referenced in rules text. It also doesn't work in Limited, where it's just a 3 mana 2/2 with some confusing text that does nothing. I'd stay away from Commander cards for this one if I were you. Just going to bow out then. Have fun. Everyone's a critic Tesagk . People are being helpful though. It is a cool idea it just doesn't work in the way you have it designed. I've got nothing against the help. I'm just not wanting to do this particular challenge. 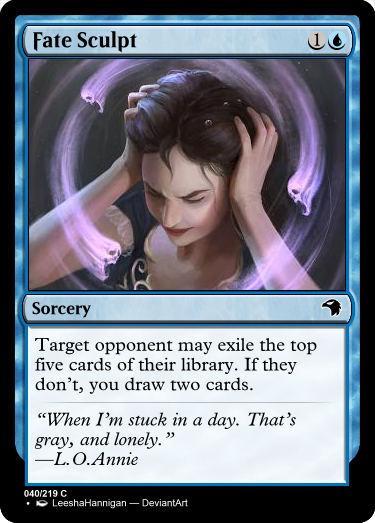 Target opponent may exile the top five cards of their library. If they don't, you draw two cards. ~ enters the battlefield with a -1/-1 counter on it. Whenever another creature you control attacks, you may remove a -1/-1 counter from Slatherskilk.